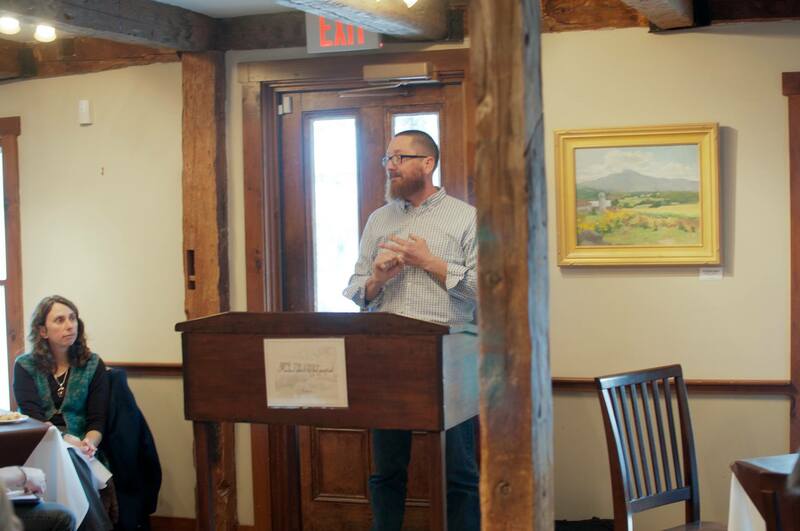 On April 1, 2014, the KVTI held their monthly Speaker series at the GRAZE Café in New London, NH. The Initiative had the pleasure of having guest speaker Steve Whitman discuss his knowledge of permaculture and many experiences. Immediately, Steve asked the audience “Can anyone define or tell me what permaculture is?” A hand rose, and Sophie Viandier (Newly elected Andover Selectwoman) responded with “it is a design system that aims to use ecological systems to provide for humans needs.” This definition and was spot on. The event gave gardeners and people interested in gardening the opportunity to listen and ask questions from a knowledgeable source such as Steve Whitman. As Steve said in the beginning of the presentation, permaculture goes way past gardening. It becomes a lifestyle and a practice in which you continuously learn. In 2001, Steve and his family moved to Plymouth, which was a more rural area compared to his half-acre property in Danbury. His new home was built in the 1890’s in a more suburban area. The first thing Steve did was build a 4×8 raised bed with his son, “We had no idea what we were doing,” he admitted. Afterwards he moved onto sheet mulching, and at the time he used chickens to help break up the land. He humorously joked that working on your lawn and applying permaculture techniques is a “sickness” because your goals as a gardener are constantly changing and there are always new opportunities and surprises to change your area. Steve and his wife spent the first 1.5 years getting to know the land and explained how everyone has different goals when planning their yards. It’s about knowing and learning the different responses vegetation have on the landscape and other species. Areas of the lawn such as a section along the side walk was converted into a “Forest Garden”. For a definition of this practice click on the link here. This area was close to the road and traffic, but was easily accessible by Steve’s Family, people walking by. It the matter of 2 years the area went from having blueberry, high bush cranberry, elderberry, etc. to having 42 different species of plants no taller than 12ft. Steve and his family are able to harvest the food from this garden forest directly from their lawn too their kitchen. This is one of the benefits of implementing practices such as Steve’s to areas. Of course at the time it was a big investment, which included taking a couple of days to order and plant materials, but the payoff was worth the effort. A surprising fact was that some of the best vegetation was brought not by Steve, but from the birds, pollinators, and other organisms. In 2013 Steve took a break from maintaining his permaculture gardens. He didn’t plant any annuals, no vegetables, but he did maintain his rice patties. He later then traveled for 1.5 months, returning in August of that year. Many of us know that August is a fast growing month. Steve described his experienced by explaining how he had to mentality prepare himself for what was waiting for him back home. He was returning from his cross-country trip and had to constantly prepare himself for the mess that awaited him. He was eventually greeted by what he called as “a jungle”. There were plants which he didn’t even recognized and questioned whether or not he planted some of the plants that appeared. Although the brutal sight was intimidating, it surprisingly only took Steve about 3 hours to clean up the lawn. He told this story because it reinforced how he continued to learn about vegetation, how they live, and how there’s always something knew to learn. In today’s society many home owners try to control their lawns rather than have nature perform natural ecosystem services and processes. This is usually done through mowing their lawn, and using artificial fertilizer and pesticides. Many people see Steve’s yard and other landscape projects on television and it makes the process look expensive and hard to maintain. This is because TV episodes condense the work into a small segment with before and after viewings. Yes, time, effort, and planning are required to apply practices to your lawn, but there is a misconception. The great thing about Steve’s garden practices is that it requires minimal effort to maintain his land over the long term. Integrating your lifestyle into your land is rewarding and can be done by anyone who has the commitment and passion. Steve Whitman brought up the point that many people fear about what may happen when they attempt to plant and apply certain practices to their land. This includes attracting animals to their property and disrupting the vegetation. Steve said, “I’ve had more destruction from soccer balls then animals”. It’s about combing the lawn with your life, diet, and also the ecosystem. When starting a project they’re always concerns about what may happen, but if you start with a deep sense of enthusiasm and purpose, there are endless opportunities to change your lifestyle, feel a sense of empowerment, and influence others. When looking at this opportunity from a community standpoint, a good question to ask ourselves is how we can turn areas such as the town hall, library, and other public areas into similar landscapes. Using resources such as the Eat Your Yard! This initiative incorporates the entire town into its projects and works to create an image of a self-sustaining and resilient community. What is great about applying permaculture designs to an area is that they’re scalable. Every building, person, and piece of land is going to have a different area to work with. This offers opportunities for many to explore their creativity, and show what is possible. Projects such as these help bring the community together in which people get to teach, learn, and discuss their practices. 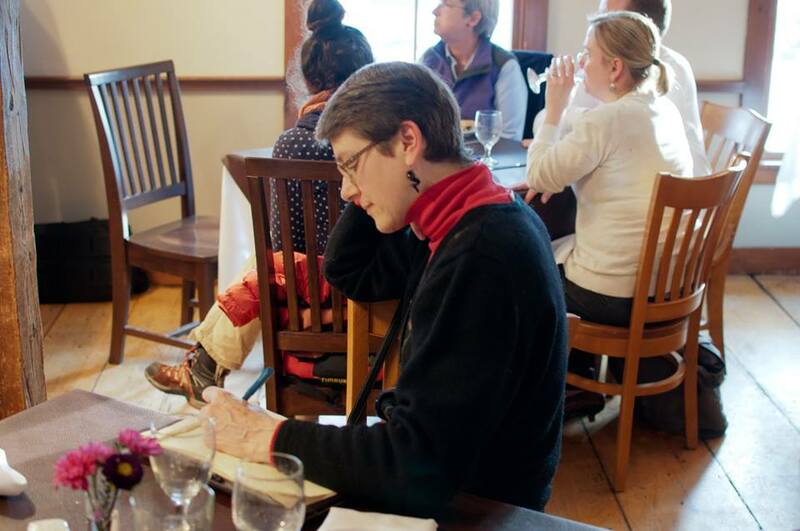 Hannah Raddatz is currently a third year, Environmental Science Major and Biology Minor at Colby Sawyer College. Within the KVTI she is involved in the GRAZE Speaker’s Series and is of the main editors for all aspects of the initiative from articles to reports. In addition to being a student, she is a peer tutor working at CSC’s Academic Development Center. Hannah is a published poet within CSC’s literary magazine Solidus.